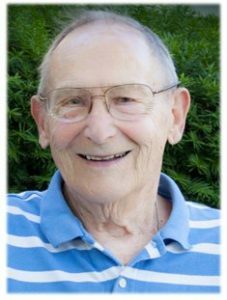 Wilfred E. “Willie” Krainz, age 88, of Roger Street, Port Washington, WI passed away peacefully Thursday, August 2, 2018 at Lasata Care Center in Cedarburg where he had lived the past few months. He was born on September 21, 1929 in Port Washington, WI; son of John and Johanna Rotscheck Krainz. A life-long resident of the city, Willie graduated from Port Washington High School, Class of 1948. During the Korean Conflict, from 1951 until 1954, Willie served in the US Marine Corps, achieving the rank of Staff Sergeant…his friends said “he must have sucked a lot of a$$”. On September 22, 1956 he married Patricia Werner of Port Washington at St. Mary’s Church in Port Washington. For over 50 years, the Krainz’s have lived and raised their family on Roger Street. Before entering military service, Willie had worked in the Print Shop at the Ozaukee Press/Port Publications in Port Washington. When he returned from service, he worked for the City of Port Washington Water Department for 12 years. Later he would start at J&H Heating of Port Washington doing HVAC work. He would remain until his retirement in 1994. Active in his community, Willie was a charter member of the Port Washington Leathernecks, a long standing member of the Van Ells-Schanen American Legion Post 82 and St. John XXIII parish. He had been an active outdoorsman, especially bowhunting and belonged to the Buckskin Bowmen and Wisconsin Bowhunters Association. Willie was proud of his family and taught them what he knew about fixing anything and everything, providing the girls as well as the boys in the family their own toolboxes. He enjoyed going out socially with his wife and friends over the years, and always kept people laughing. He is survived by his wife Pat, his children Peg (John) Lyons of Elgin, IL, Linda (Dave Kline) Krainz of Grafton, Gary (Karen) Krainz of Newburg and Karen (Steve DeMerit) Krainz of Port Washington, further survived by grandchildren Shannon and Jonathan Lyons and Nicole and Desirae Moza, great-grandchildren Amariya and Gyavanna, nieces, nephews, other relatives and friends. His Memorial Mass will be celebrated at 6PM Tues. Aug. 7 at St. John XXIII Parish-St. Mary Church, 430 N. Johnson St., Port Washington. Reverend Patrick Wendt will be the celebrant. Visitation will take place from 4-5:45PM Tues. prior to Mass AT CHURCH. American Legion walk-thru at 5:30PM. Interment will take place at St. Mary’s Cemetery in Port Washington with military honors. Willie is preceded in death by his son Jon, sister Mary and her husband John “Jeep” Wildhagen, his brother John and his wife Janet Krainz and brother-in-law Barry and his wife Betty Werner. Memorials to Jon Krainz Memorial Scholarship, Port Washington High School Community Scholarship Foundation appreciated (www.porthighscholarship.org). Previous Post: Schmalz, Kenneth W.
Please accept our condolences and sympathy on the passing of Willie. Both you and Willie were always so friendly and so nice to know. We will keep Willie and you in our prayers. We were so sorry to learn of Willie’s passing and are sending our love as you celebrate his life and legacy. We will never forget all of the fun times at Lost Lake! Pat, I express my sympathy to to you and you family. It was nice talking with you last year. Our sincere condolences on your loss. We will always have fond memories of Willie. He always had a smile and wave for us, and we always knew we could just stop by and chat. He will be missed. Please accept my deepest sympathies during this sad time. Wil was such a great guy and his humor and sarcasm will be missed. It was always a great time playing games with him and the family. Please know that you are all in my prayers.